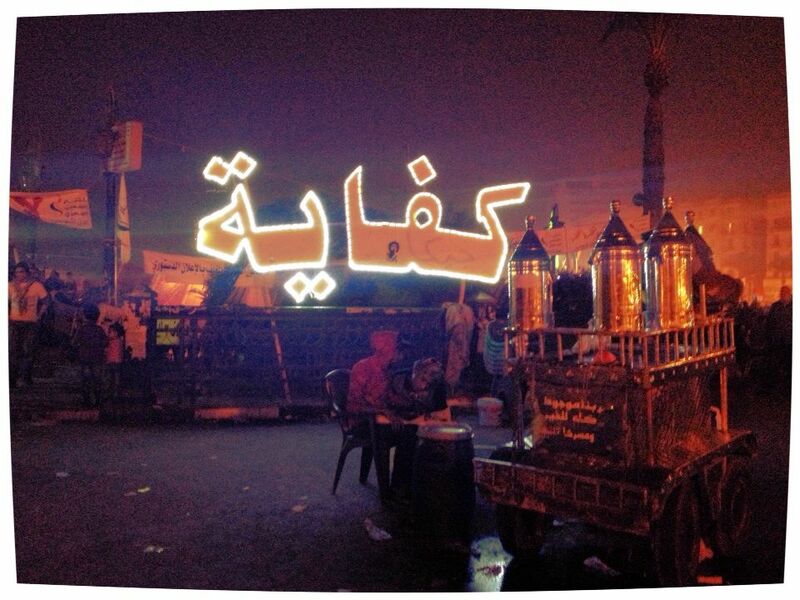 One of my favorite signs in Tahrir Square. Says, "Enough." These are the twelve major religions/faith categories on this spinning ball in the sky. According to Adherents.com and Wikipedia. I’m mostly in category 3, participate in the traditions and practices of 1, and have an understanding and love for 2, 4, 6, 9 and 12. The others I will study sometime in my life because I feel it is my responsibility to always learn more. I write about religion because it is everywhere. It is Christmastime in some of the world. For Eastern Orthodox and Coptic Christians (who have different calendars than Catholics, Lutherans, etc. ), they will fast now and not celebrate Christmas until January 7. But back in the United States, I see my friends immersed in what we call Christmastime. They are decking the halls and roofs, baking a few cookies while mostly eating cookie dough, shopping and wrapping the season’s hottest gifts, drinking beer in ugly sweaters, having a hard time concentrating at work before the winter vacation, singing along to Silent Night on the car radio. The smell of ginger and the feeling of joy. Here in Cairo, there are many churches, but not much Christmastime. I have seen only two small shops with any Christmas displays or products. I have not come across any Advent calendars, so I’ve decided just to eat an entire chocolate bar every day until the 25th. Yeah, I kinda miss this season. 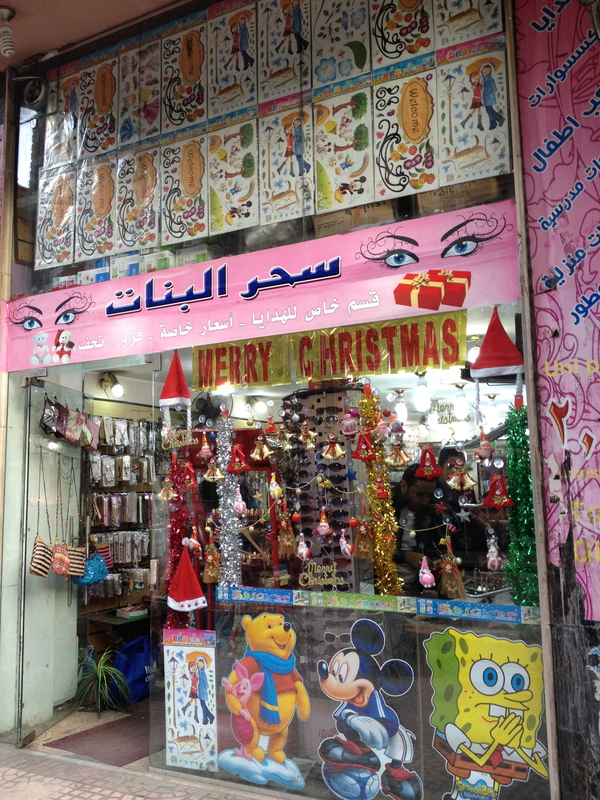 But don’t worry; there’s no Islamist War on Christmas in Cairo, religion is just not as overwhelmingly commercialized here. Storefront on Kasr El Ainy. I also write about religion because I was struck by a recent comment of a student at Minia University. He said, “Egypt has people of all three religions.” While yes, there are three Abrahamic faith traditions (four if you include Baha’i) which share much history and beliefs and prophets, there are at least nine other major world religions that I do not see recognized or respected here in Egypt. This is important. Especially as Egypt works to revise the constitution. Will it provide protection for all religious minorities? Future immigrants from other regions? Will the constitution contain equal rights for Agnostics? For families of mixed faiths? 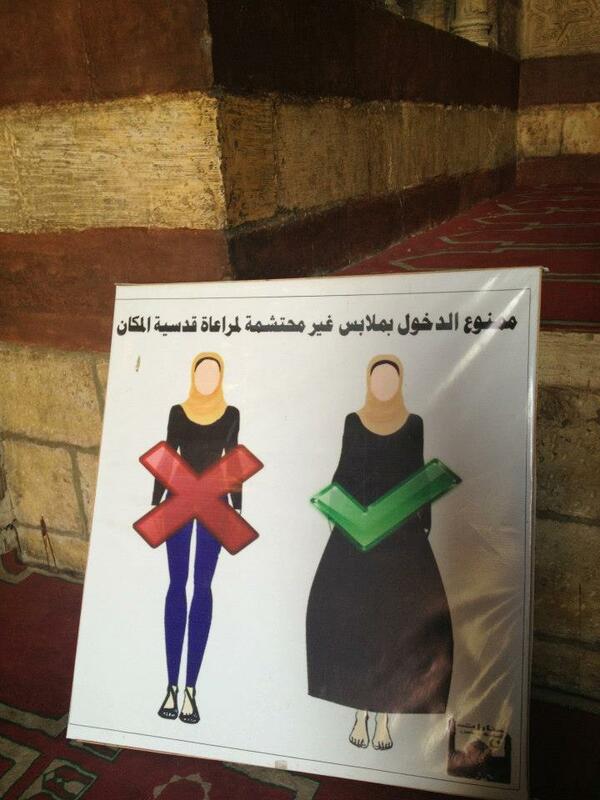 Sign at the entrance of a mosque here in Cairo. Hoping not to find similar signs in any public places. I also write about religion because the Muslim Brotherhood are trying to govern this country, and they are a religious group. I do not wish to demonize all their members. Most are loving family-values type of people. In my head, I equate them with right-wing, Fox News, conservative Christians in the U.S. And I don’t want to confuse the Muslim Brotherhood with all Muslims. Islam is just as strong with many of the liberal groups here. A beautiful faith. This is not a clear battle between religion and revolutionists. This is a different fission: supporters of the moves of Morsi/MB and the direction they are headed with the constitution, the speed in which they are moving with the referendum, etc. VS The Opposition which includes January 25 revolutionists, 21 major liberal groups, feminists, secularists, and the Muslim educated class. I stand with the opposition, whatever their faith. Indeed I do. 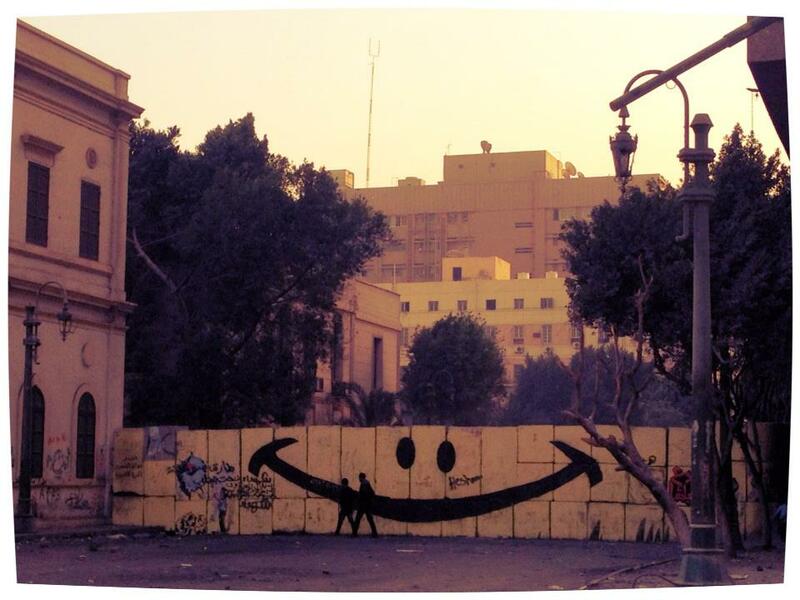 Police wall blocking Tahrir Square from Kasr El Ainy. The revolutionists have given it their touch. As I was writing this post safe in my apartment near Tahrir Square, I got a call from a friend. Turn on the news. There are clashes up in Heliopolis. A battle. An attack by the MB on the protestors’ sit-in at the presidential palace. Petrol bombs. Two died. More than 200 seriously injured. On both sides. RSO patrols report significant clashes occuring between MB supporters and liberal groups in the area of Ithtadiya Palace in Heliopolis. Police and Security have taken no action to separate the groups. Injuries are reported as reportedly several thousand from each side are engaged in the clashes. No reports of clashes or security issues at Tahrir or near the Embassy. What would Prophet Mohamed PBUH/Moses/Jesus/the Buddha do? I wonder. We have been watching very closely this process as it is unfolding in Cairo with concern. We’ve expressed that repeatedly over the last weeks. Because almost two years the Egyptian people took to the streets because they wanted real democratic change. And they, therefore – not the Americans, not anyone else but the Egyptian people – deserve a constitution that protects the rights of all Egyptians, men and women, Muslim and Christian, and ensures that Egypt will uphold all of its international obligations. They also want and deserve a constitutional process that is open, transparent, and fair and does not unduly favor one group over any other. So the upheaval we are seeing now, once again in the streets of Cairo and other cities, indicates that dialogue is urgently needed, and it needs to be a two-way dialogue, not one side talking at another side, but actual, respectful exchanges of views and concerns among Egyptians themselves about the constitutional process and the substance of the constitution. It’s also important that Egypt’s courts be allowed to function during this period. So we call on all stakeholders in Egypt to settle their differences through democratic dialogue, and we call on Egypt’s leaders to ensure that the outcome protects the democratic promise of the revolution for all of Egypt’s citizens. Ultimately, it is up to the Egyptian people to chart their way forward. But we want to see a process that is inclusive and a dialogue that is truly open to a free exchange of ideas that will further the democratic process in Egypt. Shawn–catching up on your blog-feel privileged to hear your inside-out heart-felt, passionate and compassionate insights!